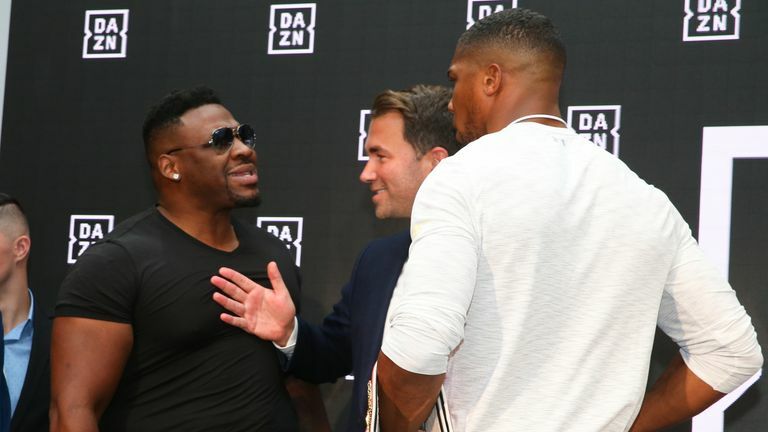 Jarrell 'Big Baby' Miller believes there is a "50-50" chance of him challenging Anthony Joshua in a world heavyweight title fight in New York next year. The unbeaten Brooklyn man has been linked with a fight against Joshua at Madison Square Garden in 2019 and will discuss his future with promoter Eddie Hearn when he attends Dillian Whyte's rematch with Derek Chisora at The O2 on Saturday night, live on Sky Sports Box Office. Unified champion Joshua is yet to confirm his next opponent, with an undisputed title fight against Deontay Wilder remaining his top target, although he could make his US debut against Miller, who would prefer to fight the British star in the summer to allow him to undergo a lengthy training camp in Florida. Miller expects to face Trevor Bryan next in January and has told Sky Sports: "Me and Eddie have a pretty good relationship. We talk all the time, we text back and forth. "He knows what I want, he knows what direction we are going in, but, if not, my most important thing would be January 18 in New York, coming up right now, so I'm still fighting in about a month. "We're going to deal with that situation and line of business first, and then we'll see what happens after that with AJ. "I think June, July, around my birthday, mid-summer time would be the greatest time for me, just because I want to give myself enough time to prepare for that fight." Whyte could also remain in contention for a rematch with Joshua at Wembley on April 13, if he overcomes Chisora, and Miller admits a world-title shot is still hanging in the balance. Asked about his chances of a Joshua fight, Miller said: "I would say 50-50. "Countless times people ask AJ about me, he just shies away from the question. He kind of moves his head, he doesn't really answer it. "Now all of a sudden, he sees MSG and 'wow, I think I should fight 'Big Baby'', and that's the end of it. He said it two times in an interview and that was it. AJ is a softie." A feud between 'Big Baby' and Whyte has been fuelled this week, with 'The Body Snatcher' issuing a warning to his American rival, who has responded by voicing his support for Chisora. "Chisora is not really on my hit list right now," said Miller. "I actually want to meet the guy and have a cup of tea with the fellow. "I've been a fan of him from the early part of my career. He's a real dog and a road warrior. "Most definitely I would like to knock Dillian out."